Analysis: Tomlinson started 24 games the past two seasons but caught just 16 passes on 764 snaps. He figures to reprise his role as a run blocker while Chris Herndon handles most of the receiving work. Tomlinson was not offered a contract tender by the Jets, Rich Cimini of ESPN.com reports. Analysis: Tomlinson was limited to eight catches for 72 yards in 15 games this past season and the 26-year-old will now look to catch on with another team as a depth tight end. Tomlinson (foot) didn't sustain any fractured bones after dropping a weight on his foot in December, Dennis Waszak Jr. of the Associated Press reports. 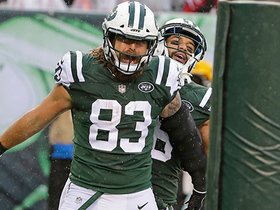 Analysis: Tomlinson landed on injured reserve ahead of the Jets' regular-season finale and consequently finished the 2018 season with eight receptions for 72 yards and no scores. Given the six-week timetable for his recovery, it's possible the tight end may not have required a stint on IR had he sustained the same injury earlier during the year. In any case, Tomlinson remains under contract for the 2019 season and should be fully healthy by the time OTAs kick off this spring. Tomlinson underwent surgery on his foot after dropping a weight on it Wednesday, Rich Cimini of ESPN.com reports. Analysis: Tomlinson was placed on IR earlier Thursday, but the injury was previously undisclosed. 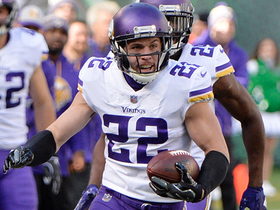 The 26-year-old apparently had lacerations on multiple toes and wouldn't have been able to play Sunday against the Patriots, prompting the move. Jordan Leggett should serve as the team's No. 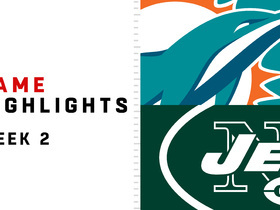 2 tight end in Week 17, and the Jets also signed Clive Walford to bolster their depth at the position. Tomlinson (undisclosed) has been placed on IR. Analysis: In a corresponding move, the Jets signed fellow tight end Clive Walford to serve as a depth option in Week 17. Tomlinson, thus finishes the 2018 season with eight catches (on 14 targets) for 72 yards in 15 games working behind Chris Herndon. 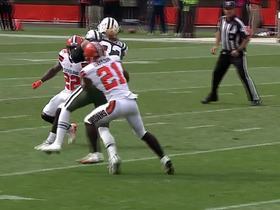 Tomlinson caught one of two targets for 14 yards in Thursday's 21-17 loss to Cleveland. Analysis: New York operated without No. 1 tight end Neal Sterling (concussion), but Tomlinson's role didn't change much, as the blocking specialist played 24 of a possible 63 snaps on offense. 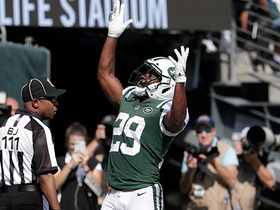 If he's not stepping up given the Jets' barren depth chart at his position right now, it's safe to say Tomlinson will never be a valuable fantasy commodity. Tomlinson caught his only target for seven yards in Monday's 48-17, Week 1 win over the Lions. Analysis: Blocking is Tomlinson's forte, so it's not surprising that he wasn't very heavily involved in the offense. 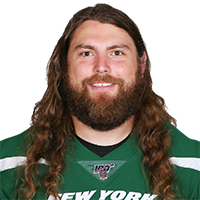 He played 29 of a possible 60 snaps, ranking third among Jets tight ends behind Neal Sterling (40) and rookie Chris Herndon (34). Tomlinson caught one of two targets for two yards in Thursday's 15-13 preseason loss to Washington. Analysis: Primarily used as a run blocker, Tomlinson is nearly guaranteed a roster spot in New York. His role isn't very fantasy-friendly, however. Tomlinson caught eight of 11 targets for 121 yards and one touchdown during the 2017 season. Analysis: Tomlinson was primarily used as a run blocker during his 14 appearances this season, and with Austin Seferian-Jenkins an unrestricted free agent, it seems pretty likely that the Jets will try to bring the former, a restricted free agent, back. Nevertheless, even if he moves up the depth chart ahead of the 2018 season, there's little reason to believe he'll become a usable asset in most fantasy formats. 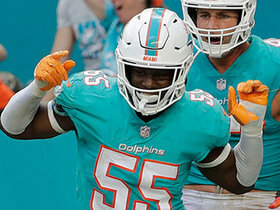 Miami Dolphins linebacker Jerome Baker runs in 25-yard pick-six. 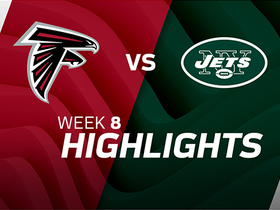 Watch the best plays from the week 8 matchup between the Atlanta Falcons and the New York Jets. 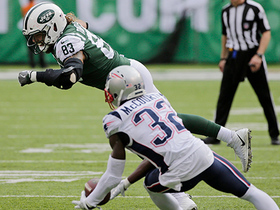 New York Jets quarterback Josh McCown tosses to open tight end Eric Tomlinson for a 20-yard touchdown. 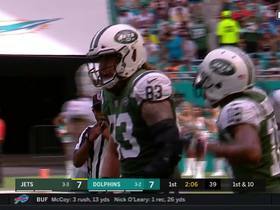 New York Jets tight end Eric Tomlinson takes the short pass from QB Josh McCown and runs 25 yards into Dolphins territory. 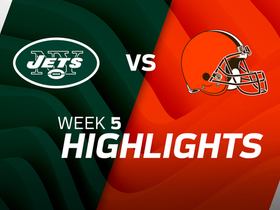 Watch as the New York Jets take on the Cleveland Browns in Week 5.